Peanut Butter Blossoms are such a holiday favorite. I like them well enough but Todd... now, he LOVES them. They are his favorite cookie! So when I found this recipe for Peanut Butter Blossoms in Chex Mix form, boy was I excited! It's pretty tasty... I mean, how can you go wrong with peanut butter and chocolate? I even scooped these into mason jars for Christmas gifts. 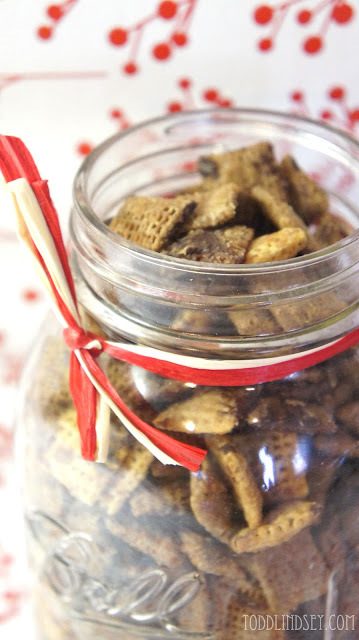 You can read about my other mason jar goodie project, Sugar Cookie Chex Mix, here. Place the chex in a large microwave safe bowl. In a smaller microwave safe bowl, melt the butter, peanut butter and brown sugar. Pour the melted mixture over the chex and gently tossed until evenly coated. Microwave the chex for 4 minutes, stirring and scraping the bowl every minute. Microwave 2 more minutes, letting the cereal brown slightly. Immediately stir in 1/2 c of the chocolate chips. Stir in 1/2 c of the chocolate chips. Spread in one even layer on wax paper and place in the fridge to set. 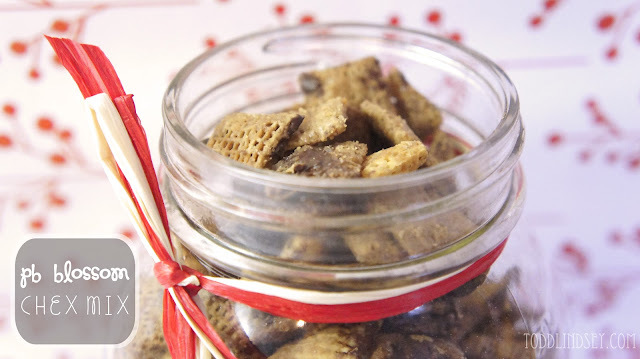 When cooled, carefully break up the chex into bite sized pieces and toss in the remaining 1/2 c chocolate chips.